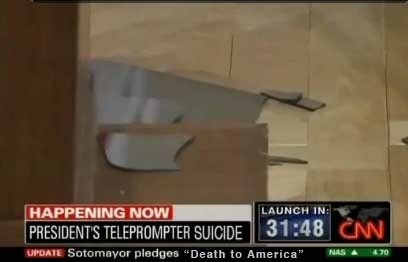 (Washington, DC) President Barack Obama’s teleprompter has committed suicide during a speech yesterday in which the president was defending his economic recovery program. Friends of the Prompter, or TOTUS, as they called him, were shocked and saddened by his passing. MS Word was not alone in his suspicion of foul play. Windex Spray Bottle, a long-time associate of TOTUS was visibly upset when asked about the situation. “This is just another part of the vast right wing conspiracy to take Obama down. I blame Talk Radio for getting the public so outraged with their hate speech that one of their psyco listeners assassinated my friend,” said Windex Spray Bottle. The secret service is being tight-lipped about any foul play, but a spokesperson said that the investigation is ongoing. A prominent Republican who wished to remain anonymous offered a different theory about the demise of TOTUS. My understanding is TOTUS was participating in a preview 0bamacare health program in which it demonstrates how private health insurance and private health care fall short at inconvenient times. Maybe it was a Japanese teleprompter with a strong sense of honor. That's deserving of a medal of Cultural Awareness and Understanding, First Class! Play At Home With President Obama's Excuse-O-Meter Game!